These Catalonians, who seconds earlier were talking in loud voices, cheering each other on and chatting about their days have now fallen completely silent. Their smiles have turned to concentration and the aura of carefree feelings has become complete focus. This group of locals is keeping alive a unique tradition. 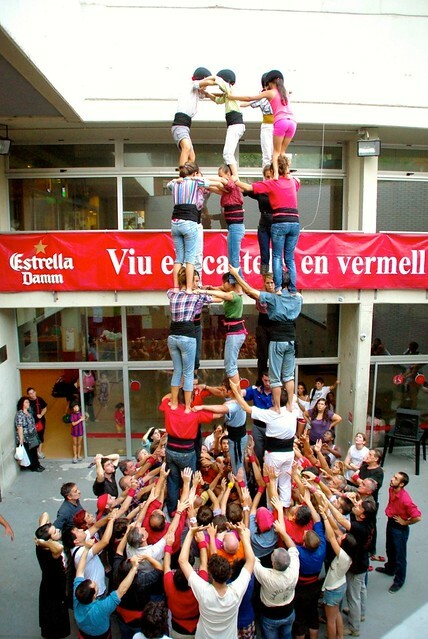 A human tower that starts with the strongest and ends with the youngest climbing up a tower to size of 5 or more people straight into the air. 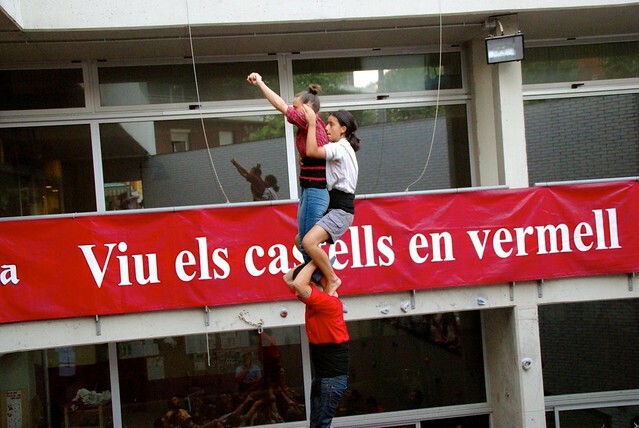 We watched for 2 hours as this team of all ages built human towers, or castells, and it is one of our favorite memories of Barcelona. It is incredible to watch the precision, balance and strength that goes into every movement. The youngest, who form the pinnacle of the tower, wear helmets to protect themselves if they fall. As new castellers arrived we watched them take great care as they tightly wrapped their sashes around them. It is one of the most important parts of their uniforms since it is used for a foothold or handhold for those climbing the tower. The sash foothold in action! First, the Pinya, the base of the tower is formed. This was my favorite part, seeing the teamwork and interlocking of arms and concentration that went into the base. After the base, the second layer begins with another strong man. 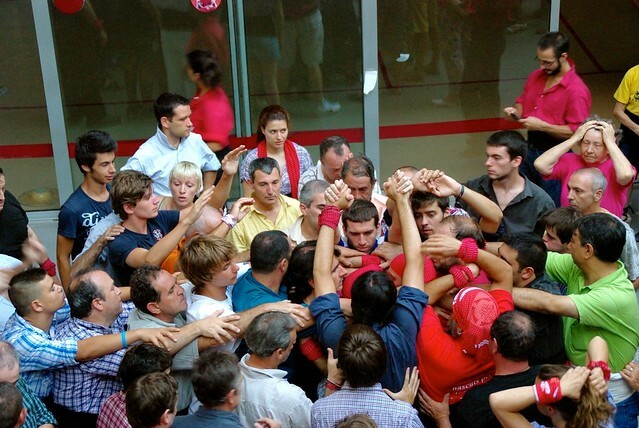 You can see in many of the pictures how the men flip up their collars, and bite the ends, I assume to keep their collars out of the way of the feet of the other castellers. 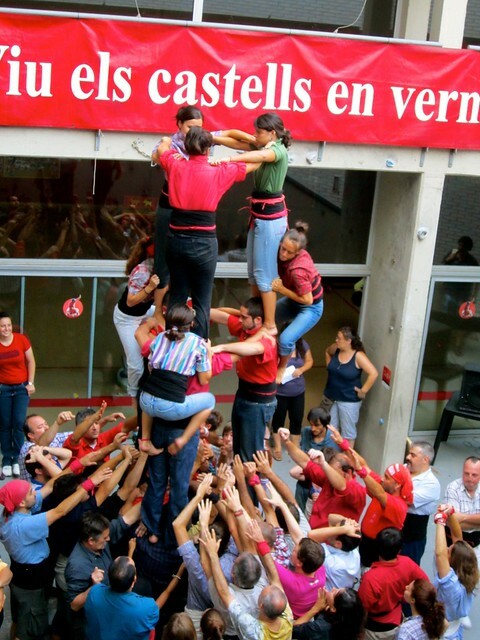 Once the base has been determined solid enough to hold the weight, the castellers start to quickly climb. They are very precise in where they place their feet on the backs of the lower tiers as they use their strength to pull themselves up while maintaining unbelievable balance. The focus, balance and strength needed to pull this off is no small feat. You can see the lower layers shake while supporting the weight on top of them, yet no one was dropped while we watched. 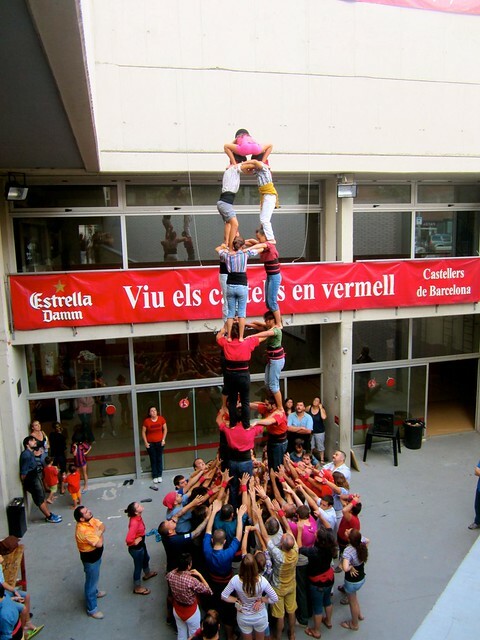 It’s an incredible display of teamwork and coordination. 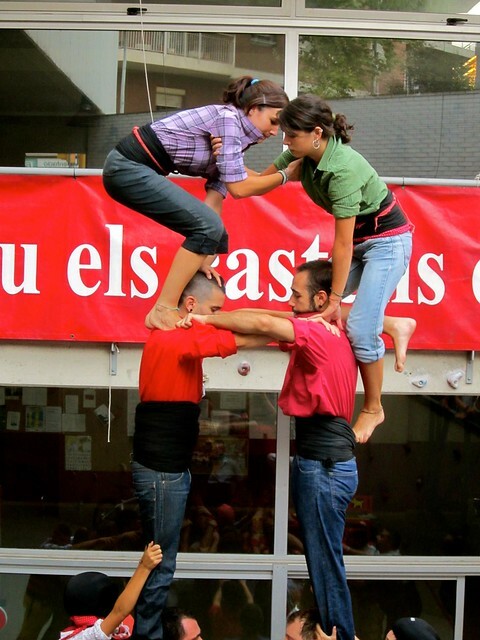 The castellers usually perform at big festivals all over Spain, or you may be lucky enough to see an impromptu castell in a plaza but you can guarantee a siting by watching them practice, which is open to the public. 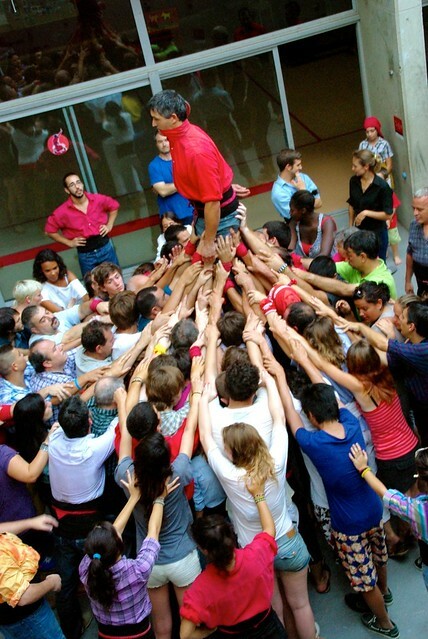 Check out the Castellers de Barcelona website for the practice calendar and location. 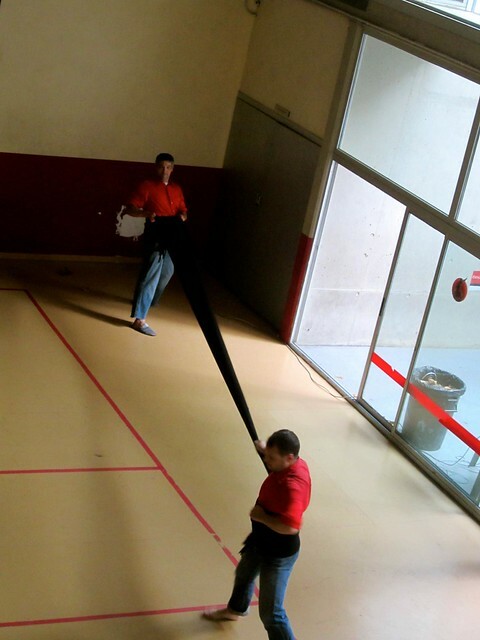 We showed up at their gym on Carrer Bilbao and were two of only a few watching. It is free to attend, just remember to be quiet and respectful as the castellers are concentrating on building the tower. We would highly recommend going to see a practice, or attending a festival if one is happening while you are in Barcelona. It was incredible! Wow! This is amazing! I’ve never made it past two people high! I’d love to watch how the professionals do it. It was the coolest thing we saw in Barcelona! I don’t think I could do it.